The Home with House podcast for this month follows a theme of progressive moods. This episode represents the progression of feelings you might experience when waking up in the morning. From being fully asleep in bed, to being half-awake and groggy, and finally to being wide awake and ready for an eventful day, this mix mirrors the moods of these stages. You'll notice that episode 5 starts off deep and soulful and slowly gains momentum and energy until the end. This sort of theme is a bit different from past episodes, but I think it turned out quite well. 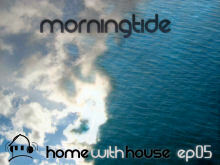 So I hope you enjoy Home with House episode 5, this one is called "Morningtide". We're watching your mixes. All very unique. Thanks for sharing my friend. Bless. gets play almost every day.